Have you seen Eleanor and her daugher Lilliana? Police are extremely concerned for a missing woman and her six-year-old daughter. 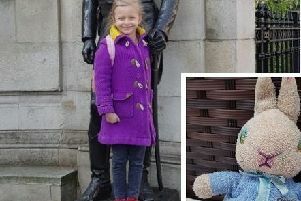 Eleanor Cutting, known as Ellie, was last seen at 1pm on Friday (February 9) boarding a train at St Leonards, East Sussex, with her daughter Lilliana Webb. According to Sussex Police, the train was bound for London Victoria. They had been living in Warrior Square but have not returned home. Eleanor, 32, is described as white, 5ft 8ins with very long brown hair and her daughter has blonde hair. Anyone who has seen them or knows where they might be is urged to contact police immediately or give details online quoting serial 592 of 09/02.